The Girls Night Out event will take place on April 28th from 5:30-7:30 PM at Dominion Electric Supply Co. in Arlington, VA, and will feature food, wine and raffle prizes. 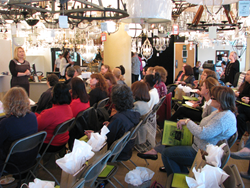 Northern Virginia remodeling company Moss Building and Design will be co-hosting their HandyMOM101 Dim-It, a DIY workshop which teaches attendees how to install a dimmer switch in their own home. The Girls Night Out event will take place on April 28th from 5:30-7:30 PM at Dominion Electric Supply Co. in Arlington, VA, and will feature food, wine and raffle prizes. In addition to the Dim It workshop, a Philips Lightolier representative will demonstrate how color temperature and the different effects of LED lighting can enhance your project. Among the prizes being raffled off is a FREE Handyman For A Day through Moss Home Services, a division of Moss Building and Design. Homeowners who are interested in attending this Girls Night Out event can visit this link to find more information and reserve their ticket. MOSS is known for their HandyMOM101 workshops and has established a wide array of skills that MOSS professionals can teach homeowners to tackle on their own. These range from learning how to patch drywall, laying and cutting tile, to using power tools. Their HandyMOM101's are community led initiatives that have placed them all over Northern Virginia presenting to organizations who are interested in learning these DIY skills. If you would like to schedule one of these presentations, you can email Community@MossBuildingandDesign.com and inquire about an event. Moss Building & Design and Moss Home Services is an award-winning residential remodeling and home services company located in Chantilly, Virginia. As a trusted home improvement company in Northern Virginia, MOSS focuses on providing customer service that is unparalleled by any other contractors in the area. Through character, transparency and trust, MOSS builds life-long relationship with customers. Over 85% of customers consider themselves a customer for life.